Purchasing a car is a simple joy in life. That feeling of freedom you experience when you buy your first used car at 16, upgrading to a sportier car once you’re out in the real world making a decent income, and then trading it in for an SUV when you need room for a family. All great feelings. What you probably don’t think about when buying a car is that it’s probably going to break down at some point, as all cars do. But if you have a tool box at home filled with the best tools on the market, you should have peace of mind knowing that your car will be in good hands. Milwaukee Tool is one of the top brands for power tools, hand tools, and other accessories for many industries, including the auto industry. Their line of hand tools in particular are great for professional mechanics as well as DIY-ers and are found at affordable prices. If you’re looking to up your tool game and fill your toolbox with the best, look no further. In this list we’ll cover the top ten best Milwaukee hand tools and why you should consider purchasing them. You should also check out our guide on the 10 Best Milwaukee Power Tools because your car deserves the best. It’s important to have the best tools on the market when working on your vehicle to ensure that the job gets done correctly and efficiently. If your toolbox is filled with old and rundown tools, it could make the job much tougher on you or you could be stuck having to take it in to a professional. There are tons of tools on the market and many of them are great options, so why choose Milwaukee Tool? They’ve been around since 1924 (almost a century!) which means they know what they are doing and they know what people need. Read on to see our list of the ten best Milwaukee hand tools that should be on your shopping list right now. Two of the most commonly used tools when working on auto-vehicle repairs are pliers and wire cutters. There are many wires that need to be handled correctly when working on car stereos or headlights, for example, in order to avoid risk of injury. Pliers and wire cutters allow you do so carefully and efficiently. But you know what would be even better and more efficient? If they were combined into one tool so you didn’t have to waste time switching between the two! Enter Milwaukee’s Combination Wire Plier. This tool makes it to the top of our list of best Milwaukee hand tools because of its ability to perform so many tasks at a great price. This is one of the most efficient tools on the market due to its ability to perform six different functions. Not only does it perform basic needle nose plier and wire cutting functions, but it also can be used for wire stripping, loop making, reaming, bolt and screw cutting, and it has a lock to prevent accidental opening. Rust is the enemy of all things metal, including tools. You want your tools to last as long as possible in order to get the most out of them and avoid having to buy new ones every few years. With rust protection, you won’t have to worry about corrosion on your pliers. Do I even have to say it? You’re getting six tools in one with this one! These pliers are absolutely worth thecost (which isn’t even that much) because you can do so much with it. If you bought all six tools individually you would easily double your cost. This tool is such a steal you should be wondering why you haven’t bought it already. 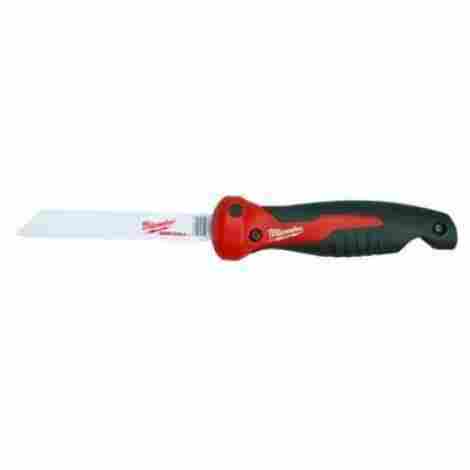 This mini, hand-held saw can be used for a variety of jobs and allows you to cut into many different materials. This jab saw is a very efficient little tool that cuts down on time having to switch out your tools because it easily folds up and locks for safe storage in your pocket. When handling a blade of any kind, you need to have a firm grip in order to avoid risk of injury. This tool has a rubber handle with notches to increase traction and avoid slippage. Having to use a tool to fix another tool seems a bit redundant. This jab saw makes it easy by allowing you to switch out the blades with the press of a button. This reduces downtime and helps you get the job done faster. This little tool is very durable and reliable. It’s great for small jobs and easily gets into tight spaces. It is easily one of Milwaukee’s best hand held tools and you can get it for an extremely affordable price. According to customer reviews, this tool is “priceless!”. We’ve got one more combination tool to review and are confident that you’ll love it. These pliers are similar to the wire pliers on our list, but are a bit cheaper. 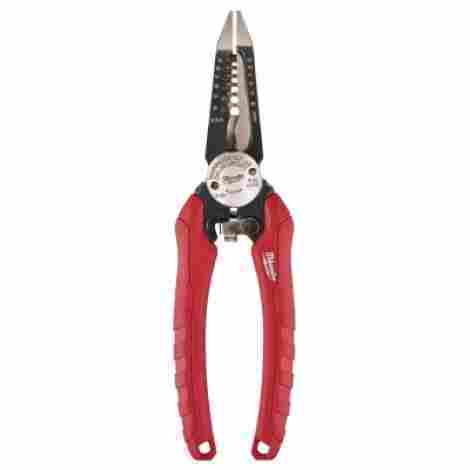 You’ll get basic plier functionalities plus the reaming head to clean out pipes and the ability to cut a variety of objects, such as wires, bolts, screws, and nails. 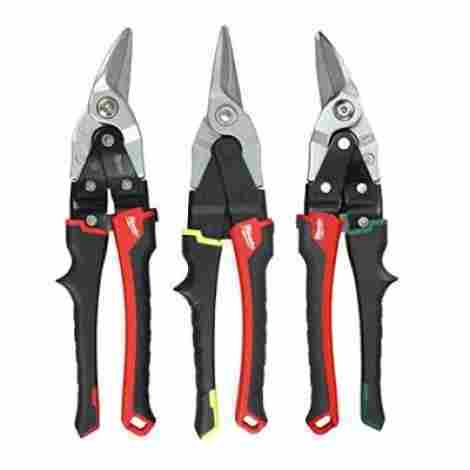 Unlike the wire plier, these don’t offer needle nose plier functions. One of the best things about buying a combination tool is that you can do several different functions without having to switch out your tools. This not only saves you time, but it generally saves you money because combo tools tend to be cheaper than if you were to buy each tool individually. With this tool, you get pliers, a reamer, and a cutter. You can pull nails and staples, cut wires, nails, and bolts, and ream pipes. This tool is a solid, quality product due to several factors. The design was made for leverage, power, and precision. The blades are laser hardened to ensure your cuts are precise and the handles are made for a comfortable grip while maintaining enough power for easy cuts. They also come with Milwaukee’s trusted rust protection for long lasting tool life. These come in at the cheapest product on this list, but don’t let that fool you. They are a quality product that offer many functions and have a long shelf life. Combo tools always offer a lot of bang for your buck. Getting six tools for the price of one is an opportunity you shouldn’t pass up. Pliers are a necessary tool when doing auto repairs, especially when working with electrical wires. In some instances, needle nose pliers are required but other times you may need a heavy duty set. This tool is a solid option when choosing a pair of pliers to add to your toolbox. Although it’s not listed as a combo tool, it does offer several functionalities. It includes a wire cutter, a reamer for cleaning out pipes, a wire crimper, and a fish tape puller. 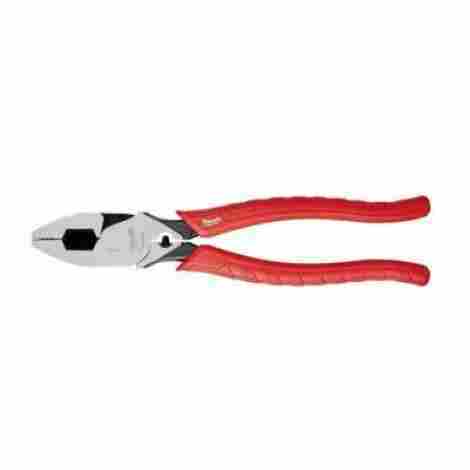 These pliers are nine inches long which is the perfect length to give you enough leverage for heavy duty wire and cable cutting. The handles are covered in a rubber overmold which provides comfort, allowing you to grip more tightly and put more strength into the force of each cut. This tool is made to last. They won’t strip away with use and can withstand day-to-day wear and tear. The rubber handles are durable as well, unlikely to peel even after extensive use. Like all Milwaukee pliers, they come with lifelong rust protection to give you peace of mind. 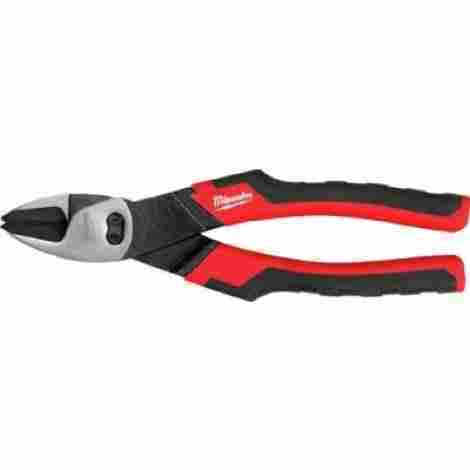 These pliers are a tad more expensive than the others mentioned on this list, but still offer a fairly affordable price. The fact that they last a lifetime as well as offer multiple functionalities makes up for the higher price tag. 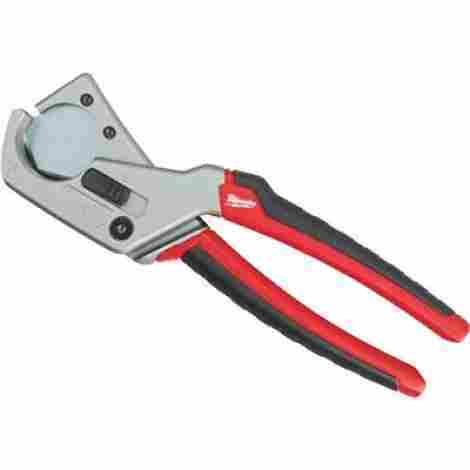 The Milwaukee ProPex/Tubing Cutter is used for rubber, plastic, and Pex-a tubing. If you’re looking for a simple, one-function tool that’s easy to use, look no further. This tool promises a long life span as well as accuracy to ensure clean cuts every time. You’ll feel comfortable using this tool due to its locking mechanism that reduces risk of injury. The sharp, pointed V-shaped blade of the Milwaukee ProPex/Tubing Cutter ensures a straight, accurate cut every time. It even includes a rework groove to fix any mistakes you may have made. When picking out the best tools for your toolbox, durability is a major factor. Well this one’s got it. Not only does it feature the usual Milwaukee rust protection, but it’s metal core is indestructible, and the blades are replaceable to ensure a long lifespan of the tool. There are certainly cheaper tube cutters out there but they won’t do as good a job as the Milwaukee ProPex/Tubing Cutter. The cost doesn’t break the bank but it is a small investment. Knowing that it’s one of the more accurate options on the market and the fact that it lasts so long should put your mind at ease when pulling out your wallet. If you’re doing at-home auto repair, you need a decent set of sockets. Sockets help you unfasten the nuts and bolts holding your car together, allowing you to make necessary repairs inside the vehicle. 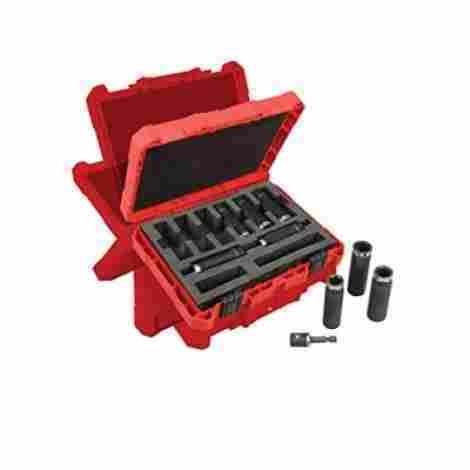 This socket set comes with 9 Shockwave impact sockets of varying sizes. The sockets in this set are very durable when used for high torque applications. They are made from chromoly steel and given custom heat treatments to increase strength and durability. This set comes with 9 sockets of varying sizes. Not all nuts and bolts are built the same. This set ensures that you’ll be able to tighten or loosen nuts and bolts of different sizes within your vehicle. This product comes out as the most expensive item on this list. Although it offers durable sockets that come in different sizes, there are cheaper options on the market that are just as good. But if you are a loyal Milwaukee brand user, you won’t be disappointed with this socket set. A voltage detector is used to detect the presence of electricity. This particular detector can be used for many different applications while promising your safety. A great feature that’s worth mentioning is the pocket clip which lets you to clip it right to your pants or shirt pocket. This allows you to continue working without forgetting where you set it down. The voltage detector is easy to use and comes in very handy. This tool is simple and easy to use for even the beginner mechanic. It’s powered by two AAA batteries and turns on with the push of a button. The voltage detector will indicate that it’s on with a green light to let you know it’s working before you even start using it. One of the great features of this particular voltage detector is that it also includes an LED work light. So if you’re working at night or in a dark space, you can easily continue working with decent visibility. This product is a very affordable tool that is worth adding to your toolbox. Not only does it ensure your safety on the job site, but it comes with the additional LED feature allowing you to continue working without downtime due to darkness. This snip set comes with a straight, right, and left cutting aviation snip. They come color coded for easy differentiation at a glance and to ensure you utilize the correct one each time. These Milwaukee snips boast high durability and extremely strong blades. This aviation snip set comes with the three most commonly used snips that you’ll need for any job. With the straight, right, and left color coded snips, you’ll easily be able to make accurate straight or curved cuts every time. The forged, serrated blades are long lasting and offer rust protection due to their chrome plating. Each aviation snip comes with a one-handed locking mechanism to ensure safety and allow for easy storage. The rubber handles are built for a comfortable and ergonomic grip to make your job much more enjoyable. By purchasing this snip set rather than buying them each individually, you save a hefty amount of money. The value you get for this snip set is absolutely worth the price. Anyone planning on doing at-home auto repairs should have a full set of screwdrivers. This screwdriver offers just this. Included with this product are the 6 most commonly used bits and 3 nut drivers. 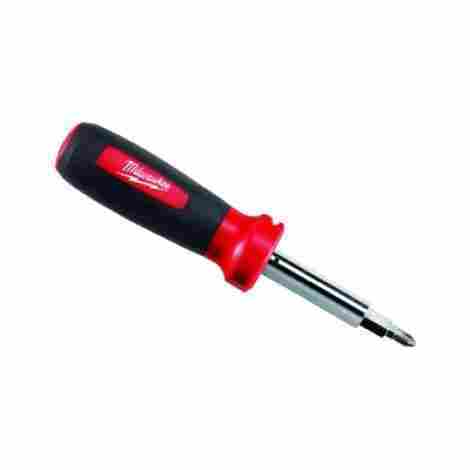 You’ll be set when any need arises for using a different size screwdriver. This tool also includes a wire stripper and bender which will come in handy for any electrical work needing done on your vehicle. A good combo tool always makes life a little easier and the 11-in-1 screwdriver is no exception. Not only is it a screwdriver and a nutdriver, but it’s also a wire stripper and a wire looper. It comes with 9 bit types to ensure you have you what you need for any job. This tool is strong and durable. It can handle a lot of pressure without stretching or contorting and the bits all last long without stripping. This screwdriver comes in at an excellent price considering everything that’s included with it. Being able to use this tool for multiple purposes as well as its strength and durability make this a very affordable tool that’s worth much more than its current price tag. Important tools for many auto repairs are the ratchet and the screwdriver. Both are needed on the job and in order to cut down on lag time Milwaukee has created a ten in one tool that includes both. Not only does it come with a standard and mini size screwdriver, it comes with 7 chrome plated bits and bit storage, wire stripping and loop making functionalities, and high torque ratchet durability. The multi-bit driver includes power groove bits which are compatible with power tools. You can easily switch from hand tool to power tool whenever you need to make your job easier. Combination tools are great for many reasons, including increasing efficiency and reducing downtime. Having to constantly switch out your tools eats up precious time and slows down your workflow. A tool that offers multiple functionalities makes your life easier and gets the job done faster. With this tool, you can use the screwdriver, the ratchet, the wire stripper, and the loop maker all in one go. Talk about bang for your buck. This tool not only includes multiple functionalities but it also comes with 7 bits, an area to store those bits, and is power tool compatible. You get so much value out of this product for a very affordable price, we highly recommend you add this to your tool box now. When working on your vehicle, you want to know it’s in good hands. Milwaukee Tool is a trusted brand that makes quality products you know will do good by your car. If you’re new to at-home auto repairs and are putting your first toolbox together, the items on this list will get you off to a great start. You’ll have exactly what you need for some basic repairs that will save you thousands in auto shop bills. For the more experienced mechanic, these Milwaukee hand tools will be a great addition to your current toolbox and will serve as great replacements for your worn out, rusty old tools. Knowing you have the right toolbox in your hands will erase any concern you had when buying your new car. A very important factor to consider when buying tools for auto repair is how long they will last. You don’t want to be running to the store every year to replace a tool that rusted or got worn down. This wastes time, money, and can get frustrating. Do yourself a favor and just buy a quality, long-lasting tool from the get go rather than trying to save yourself a buck or two by going with the cheap alternative. Try to purchase tools that specifically offer a long shelf life. There are many different ways that a tool can “die” including rusting, stripping, corrosion, or simply breaking. If the tool has metal parts, check to see if it offers rust protection. If it will be used with high force, you’ll want to make sure the material is made to reduce stripping. And of course always read user reviews to see if the product is actually as high quality as it claims to be. The product may look well put together but if it’s made cheaply it could easily break or fall apart when used extensively. 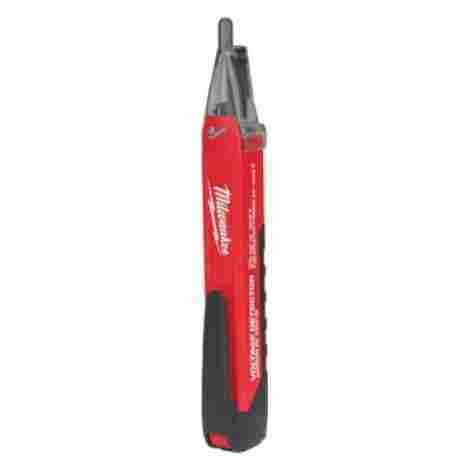 Milwaukee Tool is known for having high-quality products with long shelf lives. Almost every one of their hand tools offer rust protection and some are even made with indestructible materials. When purchasing a Milwaukee hand tool you should have every ounce of confidence that it will last you many years, some even a lifetime. In this list we cover several combination tools, and for good reason! Multi-purpose tools are a great way to save time and money and just make your job a little easier. It’s certainly not necessary to have combination tools in your toolbox and some are actually better as a standalone tool with one purpose. But when you can, try to opt for the tools that offer multiple functions. If you’re underneath your car getting some solid work done but then realize you need another tool to continue working, you’ll have to roll out from under the car, sift through your toolbox, then roll back under and get back to work. It’s not the worst thing in the world but it is a slight hassle and inconvenience. Now imagine if you were working under your car when you realized you needed to change tools and all you needed to do was press a button or flip a switch on the tool you’re currently using. Much easier right? Combination tools are great because they truly do cut down on lag time and won’t slow down your workflow. They also tend to be a better bang for your buck because if you were to buy all of the tools individually it’s usually more expensive. Think about if you were at McDonald’s. Would it be cheaper to buy a burger, fries, and a drink? Or to go for the combo meal? It’s always cheaper to go for the combo! The several multi-purpose tools listed on this guide are all great value products and are highly recommended. So why not make life a little easier and go for the combo? A tool that is durable should be able to take excessive force as well as withstand day-to-day wear and tear without requiring much maintenance. The tool should have been made with materials that prevent stripping, corroding, cracking, peeling, or breaking. Most Milwaukee hand tools claim to be very durable and you shouldn’t have much issue with the one’s on this list. Strength is the other side of the coin that you need to consider when buying a hand tool. Power tools do all the work for you so strength isn’t as big a factor for them. But with hand tools, the power comes from your muscle so you need a tool that is going to make it easy to get your power across. You’ll need a tool that was designed with leverage in mind so that you can easily maneuver the tool in the way you need to. It also should have comfortable hand grips to ensure you can put force into the tool without slippage and without hurting yourself. Lastly, ease of use is an important factor when purchasing anything, including hand tools. Tools come in all shapes and sizes, some with buttons or switches, and some with multiple functions. Fixing a car is hard enough already, why make it harder by using complicated tools that are difficult to use? If you are new to fixing cars, you’ll want to start with some simpler tools. Opt for ones that have simple on/off buttons or indicator lights that tell you when it’s working. Color coded tools are great for easily differentiating between them in your toolbox. It’s also important to choose tools with easy grips that are designed to avoid slippage. Some tools come with a locking mechanism that easily clicks into place for safe storage. And one of the best features for an easy-to-use tool is a pocket clip. A tool that easily clips onto your pocket will make the job much easier when you don’t have to find a safe place to set the tool down and then forget where you left it. 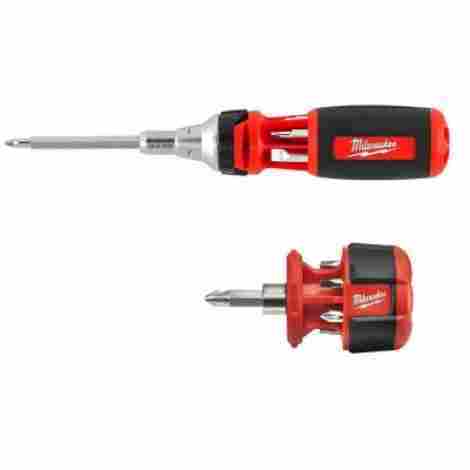 Milwaukee Tool is good at making simple hand tools that are easy for most newbies to use as well as professionals. Most of the tools on this list are very user friendly and a few offer specific features that make them great for beginners. Just make sure you choose a tool that makes sense for your level of experience and feels right to you. Q: What are the most commonly used tools for at-home auto repair? Many tools are frequently used for at-home auto repair, but you should have at least these five hand tools in your toolbox: a socket set, wrenches, screwdrivers, pliers, and wire cutters. Other tools you may find useful for auto repairs are a code reader, a jack, and a deadblow mallet. You’ll also want a flood light to brighten up the dark spaces in the vehicle, latex gloves to keep grease off your hands, and duct tape or electrical tape. Q: Is it better to buy multi-purpose or single function tools? In many cases, it makes sense to purchase a multi-purpose tool because you’ll save money as well as reduce downtime in your workflow. You should try to purchase multi-use tools when the functions are simple because they don’t need as sophisticated of a setup as more complicated tools. Some multi-purpose tools can sacrifice performance for function which isn’t always the best option. Certain tools that are more niche or complicated are best purchased as a standalone tool to ensure they are designed for maximum performance. Q: Who makes the best, affordable hand tools? Here a few of the best brands that offer quality and affordable hand tools: Milwaukee, BOSCH, Dewalt, Makita. Milwaukee Tool has been around for almost a hundred years and is a trusted leader in the industry. They use top of the line materials to guarantee that they only offer the best and it shows in their tool’s proven performance and durability. Their tools consistently have high user reviews for quality and shelf life. Milwaukee Tool continues to provide innovative tools that not only get the job done, but actually save time and increase productivity. Q: Does Milwaukee offer a warranty on their hand tools? Yes, there is a limited lifetime warranty on Milwaukee hand tools. Free repairs and replacements are offered if the product is defective, but it is not covered under warranty if the issue is due to normal wear and tear or misuse. You can find more information about their warranty policies on their website. Q: Where can I find a Milwaukee service center? You can find a Milwaukee service center near you on the Milwaukee website. They also offer e-service with free Fedex shipping if there isn’t a service center in your neighborhood. Just drop your tool off at a nearby Fedex store and once it’s been repaired by the Milwaukee service team it will be delivered right to your doorstep. Q: How should I take care of my hand tools? Store them properly: Moisture can cause rust and corrosion on your metal tools so be sure to store them in a dry place. A tool box or shelving unit works perfectly. Even better if you can buy anti-rust liners for your shelves or add silica gel packs to your toolbox. Clean them after every use: Tools can get very dirty, especially if you’re working with cars which are full of different liquids. Keeping your tools clean will prevent them from getting rusty or even just stuck from grease and grime. Wash your hand tools with soap and water and be sure to dry them thoroughly after. If your tools consist of metal, spray them lightly with WD-40 and wipe them down. This keeps them working smoothly and prevents rust. Inspect them frequently: Check your tools regularly for cracks, stripping, rust, and loose parts. By keeping an eye out for these signs, you’ll have a better chance of saving the tool before the damage becomes too great.